A dull overcast day in Rotherham in summer 1962, and the crew of corporation Crossley 191 appear to be abandoning their charge outside the Angel Hotel in Bridgegate and heading for the busman’s canteen at the back of the Municipal Offices in search of some hot tea. This initial batch of twelve Crossley-bodied Crossleys, 185-196, dating from 1949, were a staple on the short service 70 to the blast furnaces and rolling mills at Templeborough, or on the longer and even busier 69 service through to Sheffield, joint with Sheffield Corporation. Behind is Park Royal-bodied AEC Bridgemaster 139 (VET 139), just a year old when this picture was taken. In an article in ‘Buses Illustrated’ in June of the previous year on the conversion of the Mexborough and Swinton trolleybuses to diesel buses, and which were operated in conjunction with Rotherham Corporation, the writer Terry Shaw commented that he’d always considered that Mexboro’s Brush-bodied Sunbeam single-deckers were ugly until he caught sight of one of these Rotherham Bridgemasters, five of which made up Rotherham’s contribution to the trolleybus conversion scheme. It’s not hard to see what he meant, as they literally were a ‘box on wheels’ Mexboro’ chose Leyland Atlanteans, almost equally as boxy but still one up on these ‘biscuit tin’ Bridgemasters. I agree the Park Royal Bridgemasters were truly appalling in appearance. The Rotherham livery application with a black mudguard on the nearside and a cream panel on the offside accentuates the asymmetrical front end. But then any livery application would have struggled to disguise this dog’s breakfast of a design. It makes the Crossley in front look sheer class! Was Park Royal the only bodybuilder for the Bridgemaster? I@ve never come across any other body for them. And was it an integral vehicle, or did it have a chassis? Glad you agree, Philip. Even from the back the Park Royal body looked ugly and overly heavy, whereas the Crossley, with that outstanding emergency window, appeared very classy and well thought out. A friend on Merseyside used to joke that Park Royal built the Bridgemaster bodies in one continuous line, and a set of shears simply came down every 30′-0" and chopped one off! Not all that hard to envision, really! The first few pre-production Bridgemasters were built at the Erwood Crossley factory and looked a good deal better. Nothing outlandish just the tidy rounded body typical of Crossley bodies of the late 50s, although by this time much influenced by Park Royal. Park Royal were very capable box makers in the late 50s and 60s! See the Crossley Story by Eyre, Heaps & Townsin. The Bridgemaster was integral, unlike the later Renown. The Bridgemaster was an integral vehicle, using (I understand) some of the same construction techniques as the Routemaster. So no other body make was available, which was part of its undoing. There is a lot of misunderstanding about Bridgemaster bodies, along the lines that Crossley did it properly, whereas Park Royal made a mess of it. In fact the change of styling when production moved to Park Royal was coincidental. Crossley had developed the original body using the Park Royal styling features which were current at the time, but Park Royal’s double deck bodywork as a whole then took a nasty turn at the behest of BET management (who in the end didn’t place the orders to justify it). It’s also true that the rear-entrance Park Royal Bridgemasters were not nearly as ugly as the front-entrance ones, and I don’t think this was just because of the entrance position. I’m almost convinced that they were completely different bodies. To answer Chris the Bridgemaster was of integral construction using only the Park Royal body largely because AEC and Park Royal were in the same group of companies. The later Renown had a separate chassis and was bodied by other companies who generally made a much better job than Park Royal. The East Lancs bodies on Renowns for Leigh and West Bridgford showed what could be done to make a very attractive bus. Thx Peter/Philip. I guessed that the Bridgemaster might have been integral, since only the Park Royal body ever appeared on them. And I agree that the rear entrance ones were the less unattractive of the two types and the Leigh/West Bridgford Renowns were a great improvement. Both types passed me by, because my travels never took me to an area where they ran. If it hadn’t been invented by AEC/Park Royal, you might have thought the Bridgemaster was a deliberate attempt to wean us enthusiasts away from liking half-cabs. 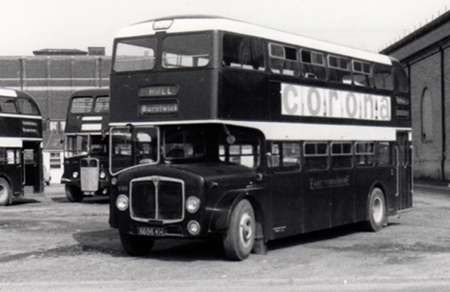 In 1948 Liverpool Corporation ordered 50 DD42/7 double deckers with Crossley bodywork to a revised design, being of four bay construction with a completely flat front (in plan view). Beauty is in the eye etc, but the result was very attractive in my opinion, and Rotherham Corporation must have felt the same, because all its Crossleys, the twelve in the 1949 batch, the further six bought in 1951 and the final six of 1952/3, had the Liverpool style of body (the very last true Crossley ever built was No.213, HET 513 of the final batch). Incidentally, the final batch of Crossleys is missing from Peter Gould’s Rotherham listing. Turning to the Bridgemaster, the construction principle certainly owed much to the Routemaster insofar as it consisted of an integral body supported on front and rear subframes carrying the engine, gearbox and axle units, but the actual subframes differed significantly between the two models. Alan Townsin has remarked that it is surprising that little effort seems to have been made to achieve a degree of commonality between the components of the Routemaster and the Bridgemaster, even allowing for the fact that the latter was low floor design with a synchromesh gearbox option. The earliest Bridgemasters had RM style coil sprung rear suspension, but from 1958 air suspension became standard. The good looking body style by Crossley on the first five Bridgemasters had framing and other components in aluminium, as did the Routemaster, but, again, no attempt seems to have been made to use RM body components. Having taken the decision to close the Crossley works, AEC transferred body construction to Park Royal, where, at the behest of the BET, steel framing replaced aluminium, making the complete vehicle heavier than its market competitors. Park Royal came up with a stark body design that somehow exaggerated the flat panel beneath the driver’s windscreen that completely obscured the offside wing. The nearside wing remained exposed in the conventional manner which gave the already ugly duckling a curiously Nelsonian appearance when viewed from the front. Considerable subframe redesign was necessary to allow a front entrance to be accommodated, and the Park Royal body then became even more gaunt than before. Aesthetics was clearly not a strong point with Park Royal at that time, because the ungainly aspects of the Bridgemaster body were reflected in the firm’s products on other chassis, and faithful customers of long standing quickly took their business elsewhere. No.752 of 1963 taken on 30 July 1963. After all the comments about Bridgemasters following the Rotherham Crossley article these pictures show that not all Bridgemasters were identical as shown by East Yorkshire’s first three batches of Bridgemasters. Note the doors on the rear entrance versions and the upper deck modified outline for Beverley Bar operations. Yes, Malcolm. As I state above, the original Park Royal rear entrance bodies were built on an earlier form of the front subframe, which had to be redesigned to permit a front entrance body to be fitted. The frontal profile of the ensuing front entrance Park Royal body was even more ‘frowning’ than the earlier type. It looks like it could well be market day in this busy scene in Upper Millgate, Rotherham, looking into All Saint’s Square, in July, 1962. It’s quite likely that 162 is performing as a duplicate on the 37 service to Richmond Park, as this route was normally double-deck operated, in fact a rebodied Bristol L6B on the 37 is already waiting behind the Reliance, ready to pull on to the stand and load. Behind that is a 1954 Weymann bodied Daimler CVG6 on the Whiston service, and behind him yet again is another Daimler, a Roe bodied lowbridge example dating from 1957, on the Canklow route. 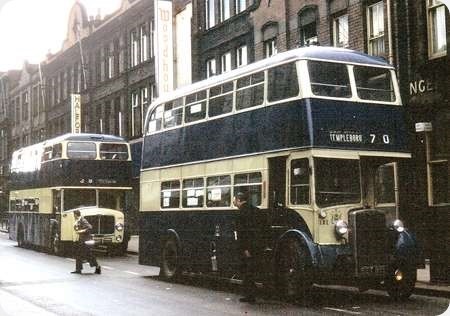 A 1949 East Lancs (Bridlington) bodied Bristol K is on the left of the picture, having discharged its passengers at the ‘Final Alighting Point’ and about to turn left into Bridgegate to make yet another journey to Chapeltown or Holmes, and further across the Square is one of its sisters on the East Herringthorpe stand, while peeping out from the offside of the Reliance is an earlier example soon to depart for Sunnyside on the 21 service. The trolley wires emerging from Bridgegate were only used in an emergency, and joined the straight through wires from the Square, which was the layover point for trolleybuses on the short working 5 service to the Pumping Station. Just slightly over three years from when this picture was taken, the trolleybuses would be abandoned, the wires cut down and the green painted traction poles dug up and taken away. Nowadays this is all a pedestrian precinct, and with many of the shops relocated to suburban shopping centres and retail worlds, the town centre is rarely ever this busy any more. You may very well be right about market day, Dave, but town centres were always much busier fifty odd years ago, before out of town shopping centres, high parking charges for those who had cars, and so on. Oh, yes, and most folk would have used the bus. Great view – is the driver aiming to hit the lady crossing in front of him, or to avoid her? One would hope it’s the latter! Thanks Pete. My father took the picture with his then new Taron Eye 35mm camera of which he was very proud. Those six Reliances, of which 162 was one, were the first underfloor engined single-deckers in the Rotherham fleet, 160-165, with matching RET registrations, so I was quite keen for him to get a photo of one for me! There was no central bus station in Rotherham in those days, and the buses left from stands dotted around the various streets in the town centre, and with all the shops, the steady stream of buses and trolleybuses, and the shoppers and the bus queues, it was a vibrant place. I just read the other day in the local paper online from Canada that WH Smith’s are closing their Rotherham branch next month, so although it wasn’t a large outlet, there will no longer be a book shop in the town centre. That would have been hard to imagine back in 1962. 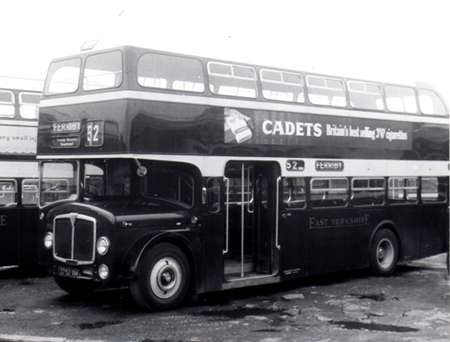 FET 617 is a Daimler CTE6 of 1950, once in the fleet of Rotherham Corporation. Originally it had an East Lancs B38C body but in 1956 it was re-bodied by Roe to H40/30R and at the same time it was renumberd from 17 to 37. It was one of the last trolleybuses to be withdrawn in 1965 when the Rotherham system closed down. She’s seen on duty at the trolleybus museum at Sandtoft which, although it is noted as being near Doncaster, is actually just over the border in the part of Lincolnshire which was in Humberside for a while. She’s turning in the area between the depot and the parade of shops. 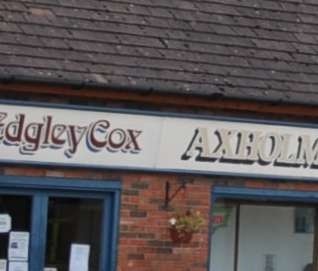 Note the reference on one shop front to a Transport General Manager who has been mentioned before in these columns! The photograph was taken on 30th August 2009, Bank Holiday Monday. As this was rebodied in 1956 when 3Oft twin axle double deckers were legal and were being built with five bay construction, I wonder why what was becoming an anachronistic six bay layout was chosen. Berisford. That was some journey, which must have been boring for whoever steered the ‘bus! It reminds me of all the ‘dead’ trolleybus movements which took place during the war all over the country. These Rotherham rebodies were very similar to the 70-seater Roe bodies on Karrier chassis for Huddersfield that were delivered just a few years earlier, which were also six-bay construction. The Huddersfield examples had the standard Roe waistrail though, while the Rotherham ones didn’t; the ‘poor man’s Roe body’, as a friend of mine likes to call it! Rotherham also saved some pennies by reusing the seats, where possible, from the scrapped single-deckers in the lower saloons of these new Roe bodies. 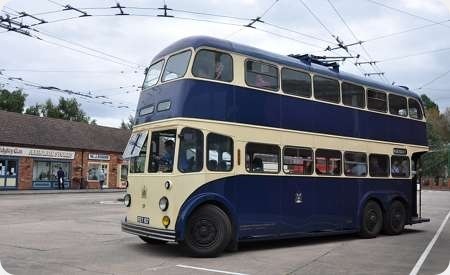 When I was a kid growing up in Rotherham, I was fascinated with the corporation trolleybuses, though I don’t recall ever seeing one operating with the windscreen open the way 37’s is here! Rotherham just never seemed to get even close to warm enough for that to happen in those days! It’s called global warming, Dave. We don’t seem to have had that in our youth! Warming? Not right now! The story of these Rotherham tracklesses (as the dedicated site correctly calls them) is fascinating. The single deckers gave a continental atmosphere to Rotherham! Was the opening windscreen really for fog? I remember that Austin 10’s had this too. So Dave, it was a case of Yorkshire tight fistedness, or what my Huddersfield born brother in law would call "being careful with t’brass"
I don’t think they had a lot of choice, really, Phil, but to be watching the pennies at the time. Those 44 Daimler single-deckers that the corporation bought in 1949-50 apparently represented a quarter of a million pounds worth of investment, and by 1954, only four years later, after the conversion of the Maltby route to motor buses, they only had work for 36 of them, the other eight having already been delicensed and advertised for sale, for which at the time there were no takers. The General Manager, I.O. Fisher, who took over from Norman Rylance who had unfortunately passed away in December 1954, presented a report to the Transport Committee in July, 1955, in which he informed them that each of the fleet of single-deckers required approx. 850 pounds worth of work to put them into ‘first-class’ condition, which amounted to something like 37,400 pounds in total, which would have been yet another significant investment. 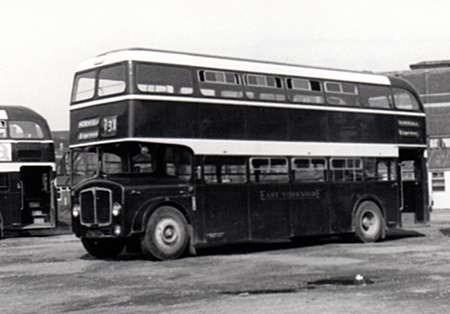 Fisher estimated that rebodying 14 of the chassis with double-deck bodies to start with would cost somewhere in the region of 32,000 pounds, and operating double-deckers would then allow him to reduce frequencies and thus reduce the number of crews required, and still have more seats available on the main trolleybus service that he considered converting to double-deck first. The Transport Committee agreed that Fisher’s idea seemed to be the most favourable option, and I guess the rest is history. In the end, twenty chassis were rebodied as double-deckers by February 1957, eight were retained in service as single-deckers until March 1961, for the jointly operated services with Mexborough and Swinton, and one was prematurely scrapped, presumably for spares, which left fifteen delicensed single-deckers in the Rotherham depot for several years, covered in grime and looking very dejected, until eventually they were sold for further service in Spain in 1960, for the princely sum of 1,133 pounds each! Two of the eight that had been retained for the Mexborough work also joined their sisters in Spain a year later, these two only fetching 1,000 pounds each at sale, and the remaining six eventually ended up in the breakers yard, sold to Autospares of Bingley, and a steal at a mere 66 pounds apiece! In the end, Fisher’s decision to rebody the uneconomical 38-seaters meant that the corporation at least got their money’s worth out of twenty of the vehicles that they’d been so proud of just a few years before. They certainly got their value out of those original moquette seats anyway, if nothing else!! I believe opening windscreens were originally to do with fog as you say Joe, and were a legal requirement. I’m not sure when the practice of fitting them ended, or when the legislation changed, but looking at ECW as an example, the new MW coach body introduced in 1962 had fixed rubber mounted windscreens. However, the Lodekka continued with an opening windscreen until, from memory 1966, when rubber-mounted screens became the standard. With the Lodekka opening windscreen, the wiper motor spindle came through the top edge of the metal surround, whereas with the rubber-mounted screen the spindle came through the bodywork above the screen. Funny the little things we remember isn’t it? That, Dave, is what can only be called a fascinating piece of transport and social history. Thanks for taking the time to relate it. Brendan, the change in Construction and Use to allow fixed windscreens on PSVs was promulgated in 1957. There had to be demisting equipment so many operators continued to specify opening windscreens. There was a halfway house that had been around for some years prior to 1957, being a single piece windscreen hinged at the top which a number of body builders offered on their double deckers. Thanks, Phil, I’m glad you enjoyed it. I can still remember my father, after his usual pre-Sunday dinner excursion to the ‘Shakespeare Hotel’, telling me that he’d seen a Doncaster trolleybus running along Fitzwilliam Road in Rotherham. I was seven at the time, and naturally went tearing off down there, about half a mile away, in the hopes of seeing it myself, which unfortunately I didn’t. Obviously, the borrowing of the Doncaster Karrier that day, June 19th, 1955, turned out to be a pivotal moment for the corporation, Fisher wanting to be absolutely sure that there would be nothing unforeseen to prevent double-deck trolleybus operation in the town before presenting his ideas to the Transport Committee the following month. What I find fascinating is that we’re still enjoying reading and writing about such events, almost exactly sixty years later! 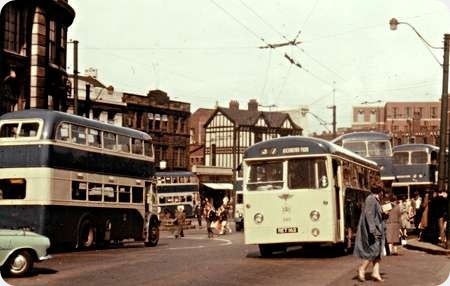 Sadly, although it’s been fifty years since the Rotherham trolleys disappeared for good, I can’t even imagine a seven year old being allowed to wander off that far from home in the hopes of catching sight of one in the enlightened world we inhabit today. As an afterthought to my post yesterday relating how my father had witnessed the Doncaster Karrier running ‘on test’ under Rotherham wires in June 1955, apparently the Karrier was driven as far as Balby terminus, the southernmost part of the Doncaster network, where it was hooked up to the Rotherham Bristol towing wagon that had been despatched to fetch it to Rotherham, it being towed along the A630 as far as the nearest point on the corporation’s wires at the Thrybergh terminus. Intriguingly, with respect to the ‘opening windscreens’ discussion, the old Bristol wagon, a full-fronted machine, had both windscreens open by the time it got to Thrybergh, being well ‘on the boil’ after dragging the six-wheeler the nine miles or so from Balby!! Luckily, Doncaster enthusiast Geoff Warnes, a mere teenager back then, got wind of the event, and followed the convoy on his bicycle, taking his camera with him, and recording the activities for posterity as the Karrier was ‘trialled’ from Thrybergh to Kimberworth and around the town centre, as well as to and from the depot, with a tower wagon in attendance in case of problems. Story has it that although he was present himself at the Rawmarsh Road garage, Rotherham’s general manager had forgotten to arrange to have a photographer on hand to record the event, and seeing Geoff with his camera, I.O. Fisher invited him into the depot to photograph the scene. Sad to report that Geoff Warnes passed away just a few weeks ago, but due to his foresight that Sunday morning, we do have pictures of the event that led to Rotherham running double-deck trolleybuses for the last decade or so of electric traction in the town. In terms of Yorkshire canniness Doncasters reuse of trolley bus bodies on motor chassis must take some beating! On the subject of towed trolleybuses I was on the M1 heading north in 1970 and stopped at Woodhall services. In the parking area was Bradford 558 an all Leyland PD2 being used to tow former Nottingham Karrier 493 to the Sandtoft Museum I bet that caused other road users a few headaches.